Act V, Scene 2. The French court. Queen: She hath good leave. Katherine: Your majesty shall mock at me; I cannot speak your England. Henry V: O fair Katharine, if you will love me soundly with your French heart, I will be glad to hear you confess it brokenly with your English tongue. Do you like me, Kate? Henry V: An angel is like you, Kate, and you are like an angel. Katherine: Que dit-il? que je suis semblable a les anges? Alice: Oui, vraiment, sauf votre grace, ainsi dit-il. Katherine: O bon Dieu! les langues des hommes sont pleines de tromperies. Henry V: What says she, fair one? that the tongues of men are full of deceits? Alice: Oui, dat de tongues of de mans is be full of deceits: dat is de princess. 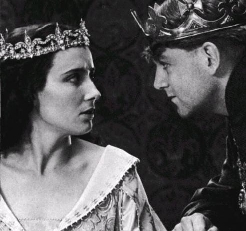 Henry V: ...I' faith, Kate, my wooing is fit for thy understanding. [I am glad thou canst speak no better English; for, if thou couldst, thou wouldst find me such a plain king that thou wouldst think I had sold my farm to buy my crown.] I know no ways to mince it in love, but directly to say 'I love you:' then if you urge me farther than to say 'do you in faith?' I wear out my suit. Give me your answer; i' faith, do: and so clap hands and a bargain: how say you, lady? Katherine: Sauf votre honneur, me understand vell. Henry V: Marry, if you would put me to verses or to dance for your sake, Kate, why you undid me:... If I could win a lady at leap-frog, or by vaulting into my saddle with my armour on my back, ... I should quickly leap into a wife.... I could lay on like a butcher and sit like a jack-an-apes, never off. But, before God, Kate, I cannot look greenly nor gasp out my eloquence, nor I have no cunning in protestation; ... If thou canst love a fellow of this temper, Kate, whose face is not worth sun-burning, that never looks in his glass for love of any thing he sees there, let thine eye be thy cook. I speak to thee plain soldier: If thou canst love me for this, take me: if not, to say to thee that I shall die, is true; but for thy love, by the Lord, no; yet I love thee too. [And while thou livest, dear Kate, take a fellow of plain and uncoined constancy; for he perforce must do thee right, because he hath not the gift to woo in other places: for these fellows of infinite tongue, that can rhyme themselves into ladies' favours, they do always reason themselves out again.What! a speaker is but a prater; a rhyme is but a ballad. A good leg will fall; a straight back will stoop; a black beard will turn white; a curled pate will grow bald; a fair face will wither; a full eye will wax hollow: but a good heart, Kate, is the sun and the moon; or, rather, the sun, and not the moon; for it shines bright and never changes, but keeps his course truly.] If thou would have such a one, take me; and take me, take a soldier; take a soldier, take a king. And what sayest thou then to my love? speak, my fair, and fairly, I pray thee. Katherine: Is it possible dat I sould love de enemy of France? Henry V: No; it is not possible you should love the enemy of France, Kate: but, in loving me, you should love the friend of France; for I love France so well that I will not part with a village of it; I will have it all mine: and, Kate, when France is mine and I am yours, then yours is France and you are mine. Katherine: I cannot tell vat is dat. Henry V: Kate? I will tell thee in French; which I am sure will hang upon my tongue like a new-married wife about her husband's neck, hardly to be shook off. Je quand sur le possession de France, et quand vous avez le possession de moi,--let me see, what then? Saint Denis be my speed!--donc votre est France et vous etes mienne. It is as easy for me, Kate, to conquer the kingdom as to speak so much more French: I shall never move thee in French, unless it be to laugh at me. Katherine: Sauf votre honneur, le Francois que vous parlez, il est meilleur que l'Anglois lequel je parle. Henry V: No, faith, is't not, Kate: ... But, Kate, dost thou understand thus much English, canst thou love me? Henry V: Can any of your neighbours tell, Kate? I'll ask them. Come, I know thou lovest me:... By mine honour, in true English, I love thee, Kate: by which honour I dare not swear thou lovest me; yet my blood begins to flatter me that thou dost, notwithstanding the poor and untempering effect of my visage. Now, beshrew my father's ambition! he was thinking of civil wars when he got me: therefore was I created with a stubborn outside, with an aspect of iron, that, when I come to woo ladies, I fright them. But, in faith, Kate, the elder I wax, the better I shall appear: my comfort is, that old age, that ill layer up of beauty, can do no more, spoil upon my face: thou hast me, if thou hast me, at the worst; and thou shalt wear me, if thou wear me, better and better: and therefore tell me, most fair Katharine, will you have me? [Put off your maiden blushes; avouch the thoughts of your heart with the looks of an empress; take me by the hand, and say 'Harry of England I am thine:' which word thou shalt no sooner bless mine ear withal, but I will tell thee aloud 'England is thine, Ireland is thine, France is thine, and Harry Plantagenet is thine;' who though I speak it before his face, if he be not fellow with the best king, thou shalt find the best king of good fellows.] Come, your answer in broken music; for thy voice is music and thy English broken; therefore, queen of all, Katharine, break thy mind to me in broken English; wilt thou have me? Katherine: Dat is as it sall please de roi mon pere. Henry V: Nay, it will please him well, Kate it shall please him, Kate. Katherine: Den it sall also content me. Henry V: Upon that I kiss your hand, and I call you my queen. Katherine: Laissez, mon seigneur, laissez, laissez: ma foi, je ne veux point que vous abaissiez votre grandeur en baisant la main d'une de votre seigeurie indigne serviteur; excusez-moi, je vous supplie, mon tres-puissant seigneur. Henry V: Then I will kiss your lips, Kate. Katherine: Les dames et demoiselles pour etre baisees devant leur noces, il n'est pas la coutume de France. Henry V: Madam my interpreter, what says she? Alice: Dat it is not be de fashion pour les ladies of France,--I cannot tell vat is baiser en Anglish. Alice: Your majesty entendre bettre que moi. Henry V: It is not a fashion for the maids in France to kiss before they are married, would she say? Henry V: O Kate, nice customs curtsy to great kings. Dear Kate, you and I cannot be confined within the weak list of a country's fashion: we are the makers of manners, Kate; and the liberty that follows our places stops the mouth of all find-faults; as I will do yours, for upholding the nice fashion of your country in denying me a kiss: therefore, patiently and yielding. [Kissing her] You have witchcraft in your lips, Kate: there is more eloquence in a sugar touch of them than in the tongues of the French council; ... Here comes your father. Re-enter the French King, Queen, Burgundy, and other Lords.